A gulf coast port was suffering growing pains during peak cruise ship season. They needed a temporary structure to use as an interim terminal to help with passenger capacity issues. The answer was a Mahaffey mega structure and two smaller auxiliary tents. Recently, Mahaffey Fabric Structures assisted a nearby gulf coast city with a high profile project. The port was experiencing increased cruise ship schedule traffic on the weekends. A new cruise ship terminal was under construction, but it would be the end of the summer before it was ready. Their existing capacity limited the comfort of passengers and they needed a partner help them figure out how to quickly alleviate the problem. The port needed a temporary structure large enough to house 700 cruise ship passengers. It needed to be a comfortable environment, and it needed to offer covered walkway access to two portable restrooms. 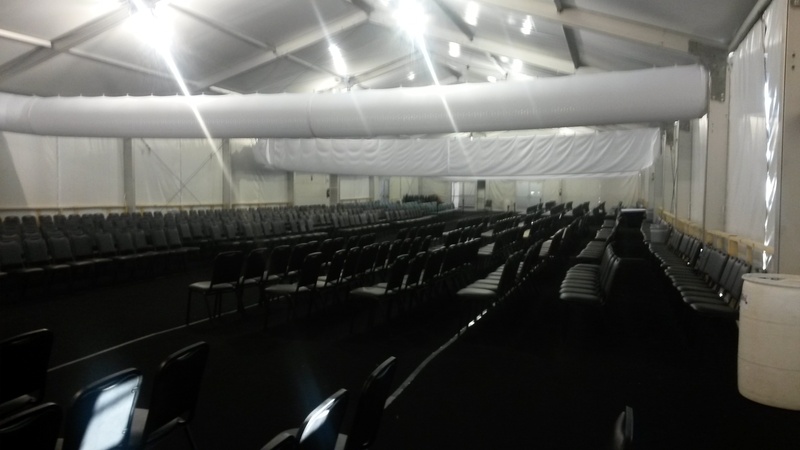 Mahaffey is known for being an industry leader when it comes to design and construction of temporary structures. We outlined our solution and plan of action for this client after our team conducted an extensive site inspection. This plan incorporated the placement of two portable restrooms near sewer connections and HVAC units into the design and layout. Additionally we provided a CAD drawing to the client. Our final recommendation was to provide three temporary terminal structures. The main structure or mega structure would provide the central staging area for passengers. Additionally, we would provide two smaller structures to connect passengers to two portable restrooms via a covered walkway. This enabled passengers to exit the main structure and come back without being exposed to the elements. A 50’ x 200’ Mega Structure and (2) smaller sized structures were installed to accommodate approximately 700 passengers. While no major challenges occurred over the course of the project, an installation timeline of approximately one week was set in place by a Mahaffey provided crew for installation and incorporation of HVAC units purchased for the new facility. Mahaffey's mega structure helped alleviate bottlenecks in existing terminals over port weekends and during times when multiple cruise ships needed to dock. They also helped increase the port’s ability to accommodate larger cruise ships and enabled the port to smoothly handle the congested weekend passenger issue by providing more overall capacity, and meeting the needs of the passengers waiting to board. In the end, the client was able to provide their passengers with a comfortable area as they waited to board a ship to vacation paradise. Expansion can be difficult no matter your industry. But when you’re a port catering to a hospitality-based industry like a cruise ship line, the passenger experience is everything. Comfort in the terminal space sets the tone for the rest of the journey. Luckily, Mahaffey was there to partner with the port to quickly shore up their capacity problems and create a smooth transition area for passengers waiting to board. 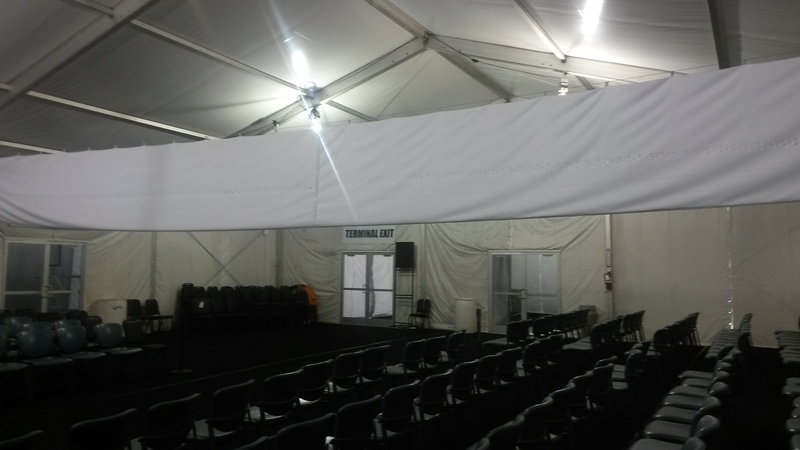 Are you interested in learning more about tents and temporary terminals for air, sea and rail, or want more information about how our portable fabric structures can be fitted for your port project? If so, click the button below.